The first encounter of St. Francis of Assisi and Sultan Malek al-Kamil in 1219 has long been a subject of great interest and the topic of several scholarly articles. In Morocco this past weekend, on the 800thanniversary of that first encounter, another Francis, Pope Francis I, and King Mohammed VI met in what will hopefully be an important chapter in this tradition of dialogue between the Catholic Church and Muslims. In a video message to the Moroccan people ahead of his visit, Pope Francis said he was making the trip as a “a pilgrim of peace and of fraternity, in a world which has great need of both” and called on Christians and Muslims to respect each other’s diversity and help one other. Further describing the difficult challenges facing the world, the King said, “In a world in search of direction, the Kingdom of Morocco has never stopped proclaiming, teaching, and experiencing, on a daily basis, brotherhood among the Sons of Abraham.” He went on to call for a new and evolving dialogue that goes beyond understanding and tolerance, based on education to tackle radicalism. “Today religion should no longer be an alibi for ignorant people, for ignorance or for intolerance,” he said. The highlight of Pope Francis’ trip toMorocco was his visit to the Mohammed VI Institute, a school of learning for imams that epitomizes Morocco’s efforts to promote Maliki Islam, a school of moderate Islam that educates religious leaders from Africa, the Middle East, and Europe. 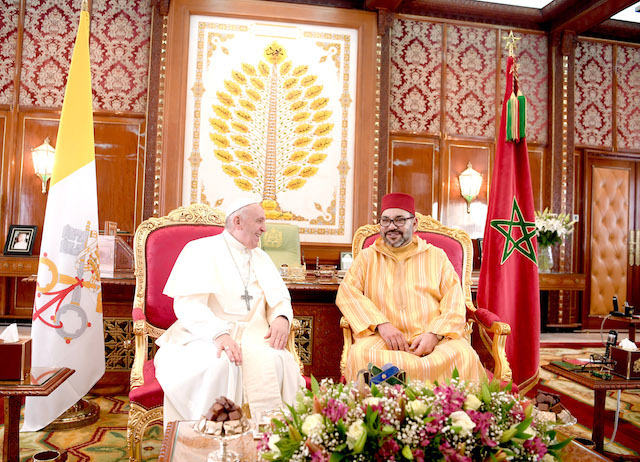 The Pope praised Morocco’s steadfast belief in and support for interfaith coexistence, and the promotion of the true path of Islam. On the topic of Jerusalem, the King and Pontiff declared in a joint statement that they were “deeply concerned for its spiritual significance and its special vocation as a city of peace.” They went on to sign a joint appeal calling for the protection of its multi-religious character, stating that the city’s sacred sites must be accessible to worshippers of all faiths. From the reports coming out of Morocco, it looks like both the Pope and the King have enriched and reenergized a new and determined dialogue that embraces the true significance of the 800th anniversary of the first encounter between the Catholic Church and Muslims.